The Guardian has published an overview of the world's most accessible cities in terms of public transport. 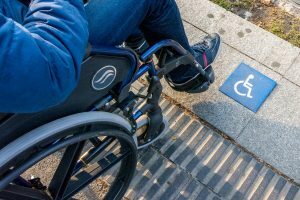 A good read for when you wonder where to travel in Europe, Asia or the United States in a wheelchair. The main outcome? The metro lines of Los Angeles, Washington DC, Tokyo, and Barcelona seem the best wheelchair accessible metro lines available worldwide. What does the article say about Barcelona? 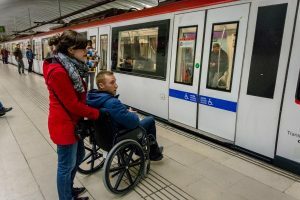 "The Barcelona metro is widely considered one of the most accessible in Europe... As in London, hosting the Olympic Games was a major impetus to improving disabled access. All metro stations built since 1992 are fully accessible, and many older stations are being refurbished. There are tactile strips for the blind, relief metro maps and voice-guided ticket machines. What the article doesn't mention is the availability of the other accessible public transport in Barcelona or the other cities > the bus. 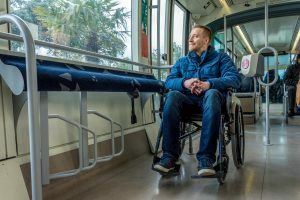 This is by far the most convenient transport means available in Barcelona for travelers in a wheelchair since all buses are equipped with ramps. Also the trams have ramps and accessible platforms.